Violence against children remains a global problem. 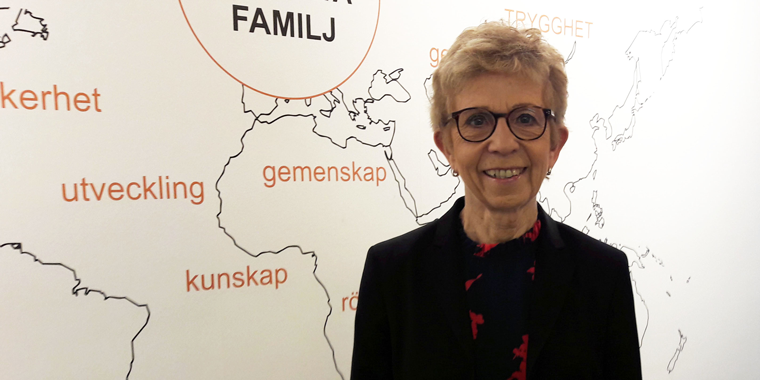 In this interview, child rights expert Bodil Långberg speaks about the impact of violence on children and the importance of working with families to prevent violent behavior. At the End Violence Solutions Summit in Stockholm on 14-15 February, SOS Children’s Villages is joining the international community in identifying solutions to protect children and end violence against them. Bodil Långberg, board member of SOS Children’s Villages Sweden, will be part of SOS Children’s Villages’ delegation at the Summit. Ms Långberg has worked in the field of children’s rights for more than 20 years. She has carried out multiple research projects and co-authored publications on children’s rights and violence against children in Sweden. Sweden has a long history of protecting children from violence and abuse, and it was the first country in the world to pass a law banning violence against children in 1979. In this interview, Bodil Långberg speaks about the severe impact that violence can have on children, the importance of supporting families to prevent violence, and the role of organizations such as SOS Children’s Villages in protecting children. Violence against children is a global problem. Is data available on how many children and young people are affected? Although there are some statistics, there is still a lack of data. If we look at Europe, for example, we can assume that at least five percent of all children are exposed to domestic abuse and that at least four percent of children are exposed to severe psychological abuse. These are low estimates. There is no global systematic approach to collect data on violence against children. In Sweden, we have carried out research into this topic four times over the years. But data collection varies from country to country. We also have to remember that when an adult uses violence against children, there are often no other grown-ups in the room. The perpetrator and the child are alone. And often, when a child tries to tell another adult what has happened, they are not believed. So it is difficult to say what the extent of the problem is. There is a significant number of unrecorded cases. Which forms of violence against children exist? It is important to clarify what we mean when we speak about violence or ‘abuse’. Do we refer to sexual, physical or mental abuse, or do we also include other forms of violence? If a child witnesses domestic violence, if a child sees that the father beats the mother, is that violence against children as well? In Sweden, it is considered a very serious issue when a child sees violence in his or her home. It is recognized that children need support when they are exposed to such situations. The UN Convention on the Rights of the Child, the Guidelines for the Alternative Care of Children and the Sustainable Development Goals clearly set out the child’s right to protection. Why do so many children still suffer from violence? I believe that it is a question of attitude and cultural factors, among other things. Violence against children and adolescents is really a public health problem. In Sweden, it has been recognized as such, and the government has repeatedly funded large research efforts. But it’s not the same in all countries. Just over 50 countries worldwide have a law banning corporal punishment. That’s only about one-fourth of all countries. Strong national child protection laws are also important. A law gives children rights. In Sweden we have had a law banning corporal punishment for almost 40 years, and we have seen a steady decline in corporal punishment over the years. But even if there is legislation outlawing this form of violence against children, you have to continuously talk about the topic, you have to inform, you have to educate, you have to invest in prevention, and you have to collaborate. Why is it so important for global and sustainable development to find solutions to end violence against children? We must understand how violence affects children, that it has a very negative impact. We really damage children for life when we use violence against them. Of course, there are very acute and immediate risks when violence happens. But there are also long-term consequences. Violence is a stress factor that can lead to poor school results, lower quality of life, mental illness and self-harm, to name a few examples. It also affects children’s self-esteem and self-confidence. In addition, when children who have experienced violence become parents, they may also be more likely to use violence against their own children. And there are indications that post-traumatic stress disorders and obesity in adulthood can be traced back to violence against people in their childhood. Are children in certain contexts or environments more likely to experience violence? Are there specific risk factors? In Sweden, we have seen that low family income, alcohol or drug abuse, low levels of education or single-parent households can be contributing factors. But it is important to stress that not everyone who has limited economic resources or a low level of education uses violence against their children. But these can be considered risk factors. Often, children experience violence in their most immediate environment – their families. Violence and abuse can lead to family separation, requiring alternative care for children. What can be done to support families to prevent violent behavior? It is very important to talk to parents from the very beginning, when the child is born or even earlier. We have to ask ourselves if we can give the parents tools, so they can handle conflicts better when they bring up the child. What kind of tools and support can be useful for parents? Showing them that it’s always best to talk to the child instead of resorting to violence. Everyone must realise that children have rights, and that we all must act in the best interests of the child, a concept enshrined in the UN Convention on the Rights of the Child. We have to talk to the child. We have to respect the child. The child is a person with rights. It’s a question of education, that’s why we must talk to the parents. Parents must understand the importance of listening to their children. Listening to and respecting the child does not mean that the child is always right. In the end, it is the parents who will have to make decisions and take responsibility. It’s a question of talking to the child, of explaining decisions and why the child’s wishes might not always be granted so the child can learn. We have to have good answers for children, not just yes or no. Parents should also be positive role models on how to solve conflicts. If you teach children to solve conflicts with violence, they may do the same when they go to school, for example. Child participation is another vital right children have. Children should be encouraged to participate in decisions regarding their lives. What can SOS Children’s Villages and other organizations that work with families do to help end violence? First of all, prevention is very important. When working with families through SOS family strengthening programs, it is important to explicitly talk about the topic of violence against children, creating awareness that it is not ok to hit a child or use any other form of violence and to discuss how families can solve conflicts without violence. Families should be encouraged to talk to their children instead of using violence. Children are smarter than many people may think. What can be done to help the healing process for children who have been affected by violence? When violence has occurred, the main concern has to be how to best protect and support the child. First of all, listen and believe what the child is saying. It can be very difficult to hear that the father or the uncle or the school teacher has abused a girl or a boy. But you have to listen to the child, and you have to believe the child. It is also important to help the child understand that it was not his or her behaviour that was wrong and caused the acts of violence. Children tend to blame themselves. That’s why it’s essential that children understand that adults are responsible for their own behavior. The specific support a child needs to cope depends on the context, the situation and the country. Any support must, of course, also be tailored to the child’s age. In every specific case, you have to ask: How can I support the individual child? Often, children require treatment to help them cope with what they have been through. With the right support, it’s possible to overcome the experience. Not forget, but eventually move on. On a policy level, what can be done to help reduce violence against children? It takes time to bring about a change of attitude and policy. Before the law banning corporal punishment was passed in Sweden in 1979, we had done groundwork for about three to four years, raising awareness that hitting a child can damage a person in the long run. We started to change people’s attitude several years before the law came into force. In addition to child protection legislation, research is important. We have to collect and analyze data in each country. To do this, we also have to ask the children. What is it important to participate in the End Violence Solutions Summit? Events such as the End Violence Solutions Summit in Stockholm, which bring the international community together to discuss this pressing issue, are very important as they keep the topic on the world’s agenda. Such international exchanges can eventually stimulate research and inspire countries to discuss legislation.